A drawing of a view of western Tuscany, from Volterra at lower left to Lucca at top right, as if hovering over Florence and looking westwards. About 80 miles (130 km) of coast is shown, with the Arno to the right. The map is rather old-fashioned by Leonardo’s standards, using the ‘molehill’ convention with towns perched on the top of steep hills, and it is likely that he was copying some pre-existing map. The purpose of the map is unknown, though the colouring, and the labelling with conventional script, indicate that it was made for someone else to see. Leonardo was a respected engineer and mapmaker. He worked for a spell as military architect to Cesare Borgia, Marshal of the Papal Troops; he drew up plans to drain the malarial Pontine Marshes south of Rome; and he planned a great canal to bypass the river Arno from the sea to Florence. 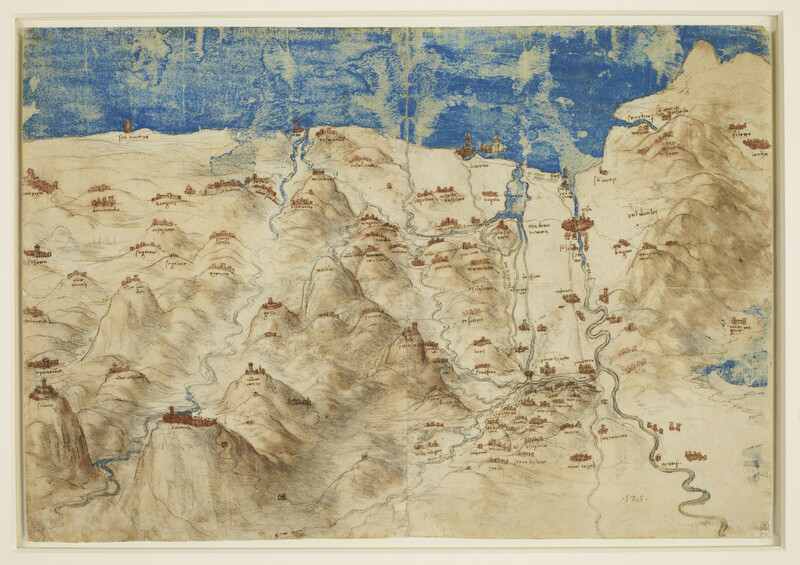 The area depicted in this map includes that relevant to the siege of Pisa, but there is no useful detail and Leonardo’s proposed diversion of the Arno is not shown. Similarly, the right edge of the sheet shows portions of the lakes through which his Arno canal would have reached the river, but there is no hint that Leonardo had that in mind when he made the map.